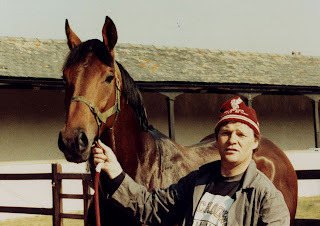 Part of his preperation before winning the Irish Derby. TRANQUIL TIGER partnered by TP Queally owned by K Abdulla and trained by Henry Cecil win the All Weather Winter Derby with a prize of £56,7770 to the winner. Run at Lingfield Park on Saturday March 20th 2010. With minder Yarmi in attendance at the starting gate.